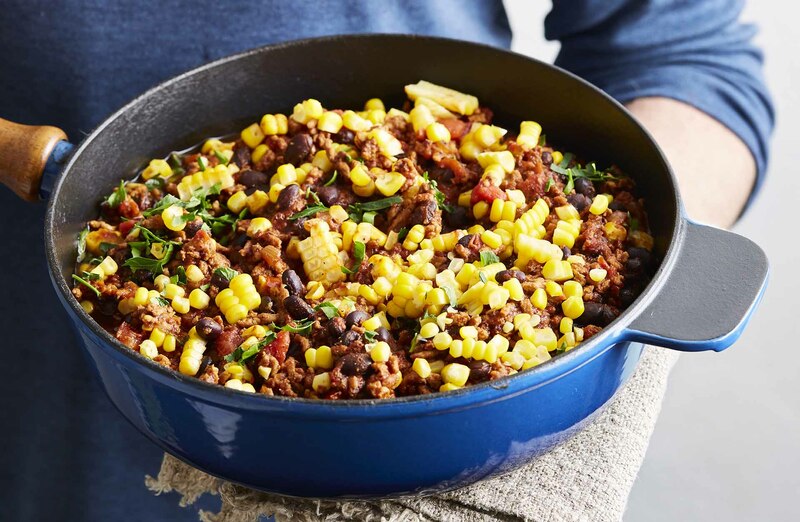 An easy and flavoursome twist on chilli con carne, spiced with delicious smoked paprika and cumin. This is a sort of pork chilli con carne. I’ve kept it mild, but if your family likes a bit more spice feel free to increase the amount of chilli powder and smoked paprika. Tinned black beans are available from the supermarket. 1. Rinse the rice well. Put the rice, 375 ml (1½ cups) of water and a pinch of salt in a medium saucepan and place it on the stove top, but do not turn on the heat yet. 2. Heat the olive oil in a large deep frying pan or casserole dish over a medium heat. Cook the onion and garlic for 2–3 minutes. Add the capsicum and cook for 1 minute. Add the cumin, paprika and chilli powder (if using) and stir-fry for 1 minute. Increase the heat to high, add the pork and stir, using a wooden spoon, to break up the mince. 3. As soon as you put the pork in the pan, bring the rice to the boil. Once it boils, cover the pan with a tight-fitting lid, reduce the heat to the lowest setting and cook for 12 minutes. Turn off the heat and leave the rice to steam, still covered, for a further 8 minutes. Do not lift the lid at any time during cooking. 4. Continue to cook the pork for 3–4 minutes until it has browned. Add the tomato and beans, season with salt and pepper and stir to combine. Bring to the boil, then reduce the heat and simmer, covered, for 10 minutes. 5. While the pork is cooking, lie the corn cobs on a board, then slice the kernels off each side using a sharp knife. Add the corn kernels to the pan. Simmer for 5 minutes, covered, then remove from the heat. 6. Stir the coriander (if using) through the pork just before serving, or serve it on the side for whoever wants some. Optional extra Serve some mashed avocado and a bowl of sour cream on the side for dolloping on top. This is an edited extract from Dinner Like a Boss by Katy Holder, published by Hardie Grant Books RRP $29.99 and available in stores nationally.